George Edward Foreman was born to J.D. and Nancy Foreman on January 10, 1949, in the town of Marshall, Texas. An impoverished youth, Foreman often bullied younger children and didn’t like getting up early for school. Foreman became a mugger and brawler on the hard streets of Houston’s Fifth Ward by age 15. Luckily, he was saved by the Lyndon B. Johnson Job Corps, a program developed to help disadvantaged kids by teaching them vocational job skills. Foreman traveled to California which is where he met Doc Broaddus, who was a Job Corps counselor and a boxing coach. It was Broaddus who encouraged Foreman to become a boxer. Once he began to train at the gym, Foreman rapidly established an impressive amateur record. The culmination of his amateur boxing career came at the 1968 Olympics in Mexico City, where he won a gold medal in only his 25th amateur fight. He got extra attention when he brandished an American flag after his win. In 1969, Foreman turned professional and within two years, Foreman was ranked the No. 1 challenger by the WBA and WBC. By 1972, Foreman had a perfect 37-0 record which included 35 knockouts. Foreman got his shot at the world heavyweight championship when he fought Joe Frazier on January 22, 1973, in Kingston, Jamaica. Frazier was the favorite going into the bout, but Foreman knocked him down six times en route to a second round knockout. An unprecedented TV audience watched Foreman become the champ because the fight was HBO Boxing’s first-ever broadcast. 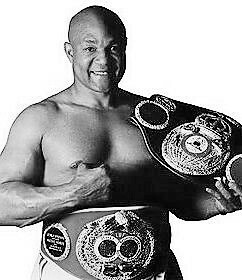 After becoming the champion, Foreman successfully defended his title twice. He beat Puerto Rican heavyweight champion Jose Roman in only 50 seconds, which at the time was the shortest heavyweight championship match ever. Foreman also beat Ken Norton, who had just beaten Muhammad Ali, in a mere two rounds. Winning those two fights then set up one of the most famous fights in history: “The Rumble in the Jungle” between Foreman and Muhammad Ali. Ali used a tactic later known as “rope-a-dope” to wear out Foreman who threw hundreds of punches during the fight. Then in the eighth round, Ali unloaded with a series of punches that knocked out Foreman and allowed Ali to regain the heavyweight championship of the world. After not fighting in 1975, Foreman returned to boxing and won five consecutive fights, all by knockout. Then in Puerto Rico on March 17, 1977, Foreman lost in a decision to Jimmy Young. It was in his dressing room after the fight that Foreman had a religious experience that changed his life forever. Foreman gave up boxing and became a born-again Christian. He was ordained a minister in 1978 and began preaching in his hometown of Houston, Texas. In 1984, he founded the George Foreman Youth and Community Center, a non-denominational place for kids who need direction like he once did. In 1980, Foreman founded The Church of the Lord Jesus Christ. However, by the mid-1980s, Foreman was running out of money and people around him were advising him to close the Youth and Community Center. Foreman saw how much the Center was helping people so he was determined to do what was necessary to keep it open. So, in 1987, after not fighting for almost 10 years to the day, Foreman returned to the ring. While there was no shortage of detractors, Foreman proved them all wrong when he kept piling up win after win. In fact, Foreman had won 24 consecutive fights during his comeback including 22 by knockout. Now at age 42, Foreman’s success and popularity earned him a chance at the title against unbeaten Evander Holyfield. The fight went the full 12 rounds and while Holyfield won in a decision, Foreman gained a great deal of credibility. After more than a year out of the ring, On Nov. 5, 1994, Foreman took on the new champ, Michael Moorer, and knocked him out in the 10th round. With the victory, at the age of 45, Foreman became the oldest fighter ever to win the heavyweight crown as well as the boxer with the most time between one world championship and the next. Foreman gave away his titles in 1995, after defending them against Axel Schultz and refusing a rematch. Foreman ultimately retired in 1997 after compiling an amazing 76-5 career record. Since the early 1990s, Foreman had discovered his talent for salesmanship, and by the end of the decade, he was making millions off of his appearances in infomercials marketing the George Foreman Lean Mean Grilling Machine. To date, more than 100 million of the units have sold worldwide. Foreman also spent over a decade promoting Meineke Car Care Centers and grew the business to over 1000 franchises. He has now successfully launched a line of environmentally safe cleaning products, exclusive line of personal care products, a prescription shoe for diabetics to prevent amputations, a restaurant franchise called UFood Grille, 10 books, and the list continues to build. Foreman tends to his ministry at The Church of the Lord Jesus Christ where he preaches four times a week. He also loves spending free time with his family on his ranch in Marshall, Texas.